On December 12, 2018, the CalEarth campus was closed down by the San Bernardino County Fire Department. We cannot reopen to the public until we complete a fire access road, which is scheduled to be completed February 14, 2019-March 21, 2019 alongside a series of civil improvements required by the City of Hesperia, for an estimated cost of $165,072. We have launched an urgent fundraiser on the website and social media to raise the funds and we need your help. In addition to the civil improvements we are working with the ICC (International Code Council) Evaluation Services to develop a standardized procedure for testing and assessing SuperAdobe, thus fulfilling a new requirement by the City of Hesperia and the County of San Bernardino in order to allow SuperAdobe permitting. We have been running CalEarth since 2009 with absolute integrity and dedication to our father’s legacy. One of our father’s biggest goals was to secure permitting of his structures, which he was able to do successfully on multiple different designs. The building codes (and building officials) change approximately every 3 years, and as such we have been in an ongoing cycle of research and revision to meet the changes each cycle. For the past 3 years we have been involved in a complicated permitting and review process with the City of Hesperia, the County of San Bernardino, and the ICC with many unexpected factors that have brought us to the current moment. See below for the detailed timeline of events, the costs associated with them, and the next steps in the process. Rest assured, we are committed to raising the funds to complete all the civil improvement requirements from the City of Hesperia, completing the ICC evaluation process, and returning to the County with that approval to re-submit our plans for approval. However, we cannot re-open the campus without your help. As far as logistics, all field trips, tours, Open Houses, and volunteer days will be canceled, and workshops will be either held in off-site locations or canceled (see workshops pages for specifics). Assuming we get the final approval and raise the necessary funds, CalEarth can return to normal operations as soon as the Fire Department signs off on their portion. Meanwhile we will continue the ICC process, and then return to San Bernardino County to complete their process (see below). As always, our primary mission remains to empower the individual through education and transfer of technology, as housing solutions for homelessness and climate change. Thank you for your support as we mobilize in this important time. We cannot reopen to the public until we complete a fire access road, which is scheduled to be completed February 14, 2019-March 21, 2019 alongside a series of civil improvements required by the City of Hesperia, for an estimated cost of $165,072, plus an additional $43,235 for the engineering and ICC costs. We also have plans to expand the campus in future phases to include additional student housing and classrooms. After years of permitting SuperAdobe structures, the San Bernadino County Buildings Department has requested new testing by the ICC (International Code Council) Evaluation Service before approving any new SuperAdobe structures. This means you cannot legally build with SuperAdobe in San Bernadino county at this time. We are currently working with the ICC and the county to arrange testing of our structures. When you commit to a monthly donation of $10 or a one-time donation of $50 or more, you will automatically become a CalEarth Member. 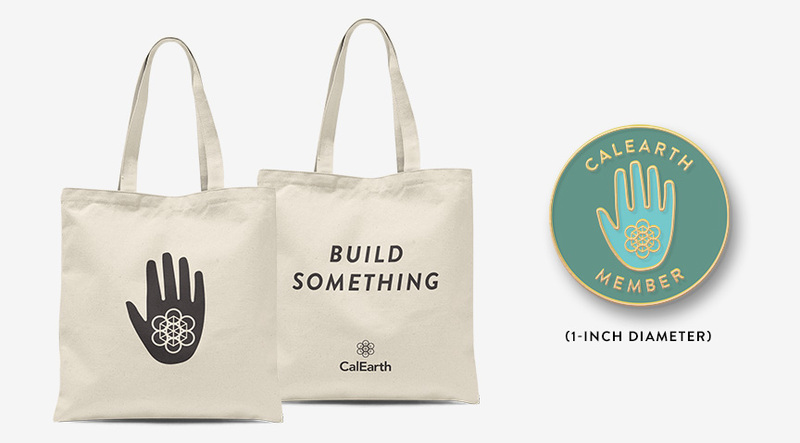 As a member you’ll be honored for your commitment with exclusive benefits including a FREE CalEarth tote and pin or access to our digital book collection, a 10% discount on workshops and online content, and a member newsletter with regular updates.